The latest edition of the Ericsson (NASDAQ:ERIC) Mobility Report, a comprehensive update on mobile trends leveraging big data from live networks worldwide, launches today and reveals that proliferation of mobile technology continues at a rapid pace: 90 percent of the world's population over six years old is predicted to have a mobile phone by 2020. Furthermore, by 2020 smartphone subscriptions are forecast to top 6.1 billion. Fastest growth for new mobile subscriptions was found in India and China, with 18 million and 12 million net additions, respectively, in Q3 2014. Rima Qureshi, Senior Vice President, Chief Strategy Officer and Head of M&A, Ericsson, says: "The falling cost of handsets, coupled with improved usability and increasing network coverage, are factors that are making mobile technology a global phenomenon that will soon be available to the vast majority of the world's population, regardless of age or location." 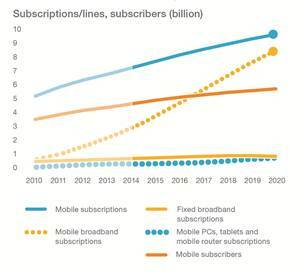 Smartphone penetration: 800 million new subscriptions in 2014 "The Ericsson Mobility Report shows that in 2020 the world will be connected like never before," Qureshi added. Smartphone growth continues as 65-70 percent of all phones sold in the third quarter of 2014 were smartphones, compared with 55 percent in the same quarter for 2013. Despite this increased rate of sales, which will see the addition of an estimated 800 million new smartphone subscriptions by the end of 2014, the report finds there is still plenty of room for growth in the sector. Smartphones currently account for just 37 percent of all mobile phone subscriptions, meaning that many users have yet to make the switch to the more feature-rich, internet-friendly option. The report predicts a strong uptake in the coming years as the number rises from 2.7 billion smartphone subscriptions today to the forecasted 6.1 billion in 2020. Video continues to dominate mobile networks: in 4G-dominated networks it currently constitutes 45-55 percent of mobile traffic, driven largely by increased usage of video streaming and improvements in the mobile video experience. Video is increasingly appearing as part of other online applications such as news and adverts, and on social media platforms. At the same time, growth in video streaming is being driven by access to over-the-top (OTT) services and content, such as those provided by YouTube. Devices used to watch video are also evolving. Many have larger screens, enabling higher picture quality for streamed video, which results in video being consumed on all types of devices and in higher quantities, both at home and on the move. In terms of future outlook, Ericsson estimates that mobile video traffic will increase tenfold by 2020, ultimately constituting around 55 percent of all mobile data traffic in 2020. 5G is expected to be commercially deployed in 2020, and the technology is predicted to have a faster uptake than 4G LTE, just as 4G had a faster uptake than 3G. The difference here is that, in addition to new radio technologies, 5G will also encompass evolved versions of existing radio access (such as 3G and 4G), cloud, and core technologies to cater for the thousands of new ways that mobile technology will be used. 5G growth will be driven to a large extent by new use cases, especially in machine-type communications. Ericsson regularly performs traffic measurements in over 100 live networks in all major regions of the world. Detailed measurements are made in a selected number of commercial WCDMA/HSPA and LTE networks with the purpose of discovering different traffic patterns.This is the seventh issue of the Ericsson Mobility Report, which shares forecast data, analysis and insight into traffic, subscriptions, and consumer behavior to provide insight into current traffic and market trends. The forecast period for the latest report has been updated to cover the period from 2014-2020. To accompany the Ericsson Mobility Report, Ericsson has created the Traffic Exploration Tool for creating customized graphs and tables using data from the report. The information can be filtered by region, subscription, technology, traffic, and device type.